I want to suggest a drastic change in how character creation and progress works. The way Unknown Shores works right now is not very appealing to new players or returning players. Most of our current population is made up of decked out characters that have reached their desired max level or XP threshhold, a point that takes several months to reach. Some characters are even so advanced, they have reached a point of growth that would take a new character more than half a year to reach, if not longer. This is very disheartening and discouraging for new players or returning players. It puts a very noticeable pressure on people to stick to that one character they are playing, log in on them every single day and pump every point of productivity they have into it's growth, but even then they know that they will never really catch up to the veterans. Creating an alt and spreading your productivity over two characters will make it even worse. I brought up a simple question on the discord recently where I asked: "If you would play on retail WoW, do you feel that need to level up your character to max level first and deck him out with the transmog you want, before you actually go into roleplay with him?" It is true, even on retail, most people like to level to max first before they think about roleplay. Most people don't like doing roleplay while being some low-level character in leveling gear that doesn't have access all the areas and possibilities the game has to offer. And on Unknown Shores, we are currently suffering the same problem. You create a new character and you feel like you are not "ready" to really play him yet. Because compared to most others on the server, your character isn't really good at anything. He is a low level guy in leveling gear. And due to how productivity works, you can't even get him really into the game with power-leveling. You are stuck with literally "waiting" 3 months or more until you get to the point where you feel on a level playing field with all the others. The other day I made a new character with the intention to just roleplay with him. Not care about productivity or leveling or any of that sort, just roleplay. Since currently, I am putting all my productivity into getting my Panda to max level. So I made this troll. He is supposed to be a hexxer, witch doctor, that sort of deal. Since I was going to stay at 0XP with him for many months due to how the system works, I gave him a supportive build for combat. At least then he can be a bit useful, healing and buffing. Combat was never going to be his focus anyways, his focus was to be roleplay. Act out his role as witch doctor and spirit speaker. I got my chance to play out my character later that afternoon. I was asked to speak to the spirits and do some divination to find something. Perfect. I even had put points into the new Skill system for divination, since that is the purpose of my witch doctor. I got a Keeper and then did my thing, emoted out the ritual and stuff. Then I got told that for proper divination or scrying, there are rules. For example, I need a minimum of 5000 XP to do it. And my immediate reaction to it was "You are basically telling me that I have to afk-park this character away on the beach for over a month, log in on him every day to push my 70 prod into his XP pool, until I reach 5k XP and then I can finally play him?" It is not only me. A lot of other players feel the same problems with the RPG. So here I am with a proposition. Every new character starts pretty much maxed out. There will be no further progression, leveling or any of that sort with productivity after character creation. This means that new characters will always be on a level playing field with everyone else, even with the veterans. Of course veterans will still be stronger than a fresh, new character since they will have better equipment and things like that. Progression may also be possible in the form of special events or special items from events. Other than that, think of "progression" the way it was back on Legacy/Prologue. You progress your characters story, the friends and enemies he makes and the name he makes for himself in the world. That has been a recipe for success in the past, I don't see why it shouldn't be here. And the RPG can continue to be what it does best: Bring some form of order and balance to the game. It is a good "ruleset" of what a character can and can't do and it makes combat events that much faster and more enjoyable for everyone. Those were always the true, biggest weak points of Legacy/Prologue, where the question of what your character can and can't do mostly dependet on GM nepo and your performance during combat was entirely based on luck (/roll 20). What about veterans / old characters? Will they be reset? Here is what I propose: Leave every old character as it is. They can keep their attribute points and profession levels as they are now. In some cases, that will make them permanently more advanced than any new characters, but since we are speaking of only a few select individuals here I don't think it'll be that big of a deal. Besides, I guess they have earned it. Naturally, every old character will also have the option of a reset to make use of the new character creation. What about people making crafter alts / gaterer alts? Yes, this is an entirely new problem that would come up with this new character creation. This can be solved in a few different way. In the past, account-wide productivity was the safety-measure here that prevented people from abusing the system with gathering alts. This new character creation however would require some slight alterations. What I would propose here, and I believe that would be the easiest solution, would be to make productivty "per character" instead of account wide. Come to think of it, with this new character creation you would no longer need productivity to level up or raise skills. The only purpose of productivity with this new system would be... to spend it on gathering. Or learning a language. So if someone doesn't have a whole lot of time to play every day, that wouldn't be that big of a deal. It's not like they would fall behind in combat XP... or raising their crafting skills or anything. That means, we could change it so that a new character starts with 0 productivity and he gains 3 productivity every hour he spends being online. No more offline-productivity gain. Maybe raise it even to 6 prod per hour. Who knows, the numbers can be tweaked here. The general idea is, that a character only gains productivity if he is actively played. Some other alterations can be made as well. In any case, I firmly believe that there is ways to make gathering or crafting alts "not viable". One last addendum to this to further explain my point. This might be a bit of a read, but I implore you: Please, read it. I played a good few years on what many people remember as Legacy/Prologue. A private RP server project from the past. They had no RPG system there. They had no crafting or gathering of any sort. You could create any character you wanted. The good thing about that server was, that it was so easy to quickly get into the RP that you wanted to do. No matter if new player or old veteran, it didn't make any difference. A new player's character had all the same possibilties and abilities as that of an old veteran. You could decide for yourself if you wanted to be a civilian, a trader, a thief, a skilled mage, a priestess of elune, a troll witch doctor, an old tauren shaman, a greedy goblin... everything was possible. And you'd always find your place in the world, no matter who you decided to be. All of Kalimdor and Eastern Kingdoms was available with plenty of opportunities to pursue your RP goals or play out your character the way you wanted. And if you were in the mood to play something else, making an alt and jumping into something new was as easy as snapping your fingers. Now Legacy/Prologue wasn't a paradise. It did have its flaws, and back then I already began discussions on the forums about how to fix those flaws. One big flaw that many people were unhappy about, for example, was the GM Nepo. Since there was no gathering or crafting system in place, no skills system or any of that sort, who was to decide what a character can and can't do? Sure, you could play a dwarf and venture into Silithus and roleplay out that you fight your way through a silithid cave until you find a precious vein of thorium, you mine it and take it back to Ironforge where you forge it into a new armor. That was your RP that you could do. But would you actually get the armor? Only if a GM was very nice to you and "validated" the RP you did. You had to take screenshots of the RP you did, show them to the GM and hope that he would approve of it and give you your armor. As you can imagine, the experience there was wildly different from player to player. Some players had good ties to some GMs and got a lot of stuff and progress. Other players didn't even get their tickets looked at for weeks. The RPG System of Shores fixed a lot of those issues. There now is no need for a GM to validate anything. You can go out, gather ore, craft your armor and get it into your bags with the system alone. And it is 100% fair. The system treats every player equally. Problem solved! The same goes for when it came down to events and combat on Legacy/Prologue. Two massive problems where there. The first problem was the amount of time it took. In a Legacy event, players took turns with writing down an emote and then rolling a d20 for their emote, then a GM had to read the emote and decide if the emote was any good and if the roll was any good, then give the player an answer to how successful his action/emote was. As you can imagine... even a small fight of 5 players versus 5 NPCs could take HOURS. The second problem was, that no matter who you were and what you did, you always had to roll a d20 to see your success. Rarely, very rarely, did a GM actually look at your character and take into consideration what skills he might have. You were playing a seasoned Kaldorei Archer and were trying to shoot a deer in the distance? Well, good luck! Literally. Because if you rolled below a 10, it probably did not matter in the least if you were a skilled archer or not. The GM would tell you that you miss, especially if the GM did not like you. Next to you stands a big, brutish Ogre with a hand-crafted bow that he never shot in his life and he rolls a 18. Wham, a hit! Who is the master archer now? The RPG System fixed this problem, too. No longer is your success chance of any action entirely dependant on luck. You have actual attributes and skills now that weigh heavily on your success chance. And the GM Nepo was removed from the equation entirely, as well. Problem solved! But what about the "good" side of Legacy? Remember how I said that you could be anyone, go anywhere? Do the RP you want to do? And just as easily roll an alt if you were in the mood for a change? Well... when it comes to this one good quality that Legacy had, the RPG System of Unknown Shores actually did not fix anything... in fact, the opposite. The RPG broke that. No longer can you just "be" who you want to be. No longer can you roll a Priestess of Elune, oh no. You will start out as a character with 0 XP that is not really "good" at anything, and to reach that point where you are who you wanna be, you need to spend several months on the server. And rolling an alt? You can entirely forget about that, unless you are content with that alt simply being a guy that is not really good at anything and all you do with it is socialize all day. I have spent a few years on a german private RP server that is vastly different from Unknown Shores. They do not have any systems there. They play on a large, custom island that holds a large, custom city. Think of it like Stormwind, only in pretty and big. The island is neutral, every race can live there. They have no PvE or PvP. They have no real events. You can still "try" to do PvP there, by emoting that you punch that one guy in the face. But it is pretty much like retail. It is emotes only and you can't force anyone to do anything really. So in the end... in those few years I was there I have never really seen anyone do conflict-RP or PvP of any sort. And the only events they ever hold are purely social in nature, for example a Hunter's Festival where players could participate in an archery contest and stuff like that. You see... on a server like this, I don't mind at all playing a character that has no particular skills. I can be totally content with playing a civilian that is good at nothing, really. Walking the streets, meeting and greeting people, socializing and (you know it) ERPing can be a lot of fun IF you have the right platform for it. And this german server does. They have a big city, they have player housing where you can have your own house (with lockable door much like Shores has) and you can decorate the inside of your house any way you want (the inside of each house is phased and you basically get GM building rights from the Admin so that you can build what you want in your own house-phase). The server does everything right to provide a very enjoyable "social RP" experience. But Unknown Shores is not that. If you play a purely social character on Unknown Shores, how much fun are you really going to get? You are stuck in a harsh survival setting, surrounded by hostile NPCs. The focus lies on PvE and adventuring. And there is no real "social" hub anywhere. You have Mel's small tavern, yeah. But aside from that, there is no player housing, there is no "town" of any sorts that provides a basic social structure for you to live in. 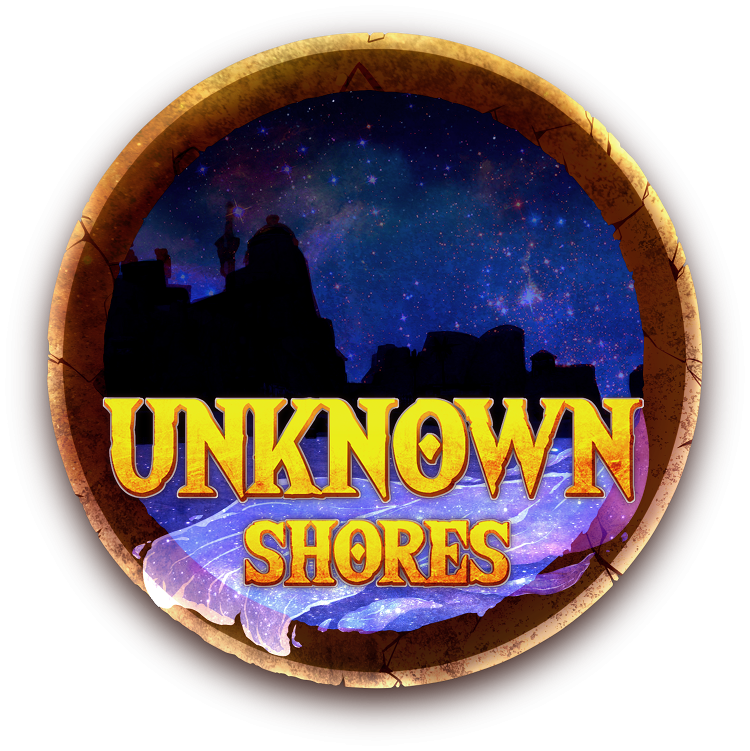 Unknown Shores is a setting that heavily supports characters that are "good" at something. A skilled lumberjack, a weaponsmith, a skilled fighter or adventurer... those are characters that have plenty of opportunity for RP and live out their dreams in the Doldrums. But... a new character does not start out as any of that. A new character starts out as a guy that is.. not really good at anything. Especially compared to all the veterans that are around. I firmly believe that this needs to change. How can you expect any new player that comes here to have a good time, when they are so limited in who they can be? How can you say "just go and RP, you don't need to be a veteran to just RP?" if there is no real foundation for a new player to do the RP you ask of them? If they are not good at adventuring, at building, at crafting or at gathering.. what are they supposed to do in this setting? A setting that is made for builders, crafters and adventurers? They are more likely to just log off again and forget about the server. Why go through months of work and hassle and "waiting on productivity" to finally be who you want to be, when on other private servers out there you can achieve the same within just a few seconds and jump right into the RP you want? As explained at the very top... the RPG already fixed all the glaring issues that Legacy ever had. It really has! The only thing that it really doesn't need... is this gamey leveling system.